Earning the right to be a U.S. Marine is something the entire family can be extremely proud of. Show off the family's patriotic spirit with a Personalized Marines Picture Frame displaying your Marine. A great Personalized Gift to celebrate a recent graduation or promotion. 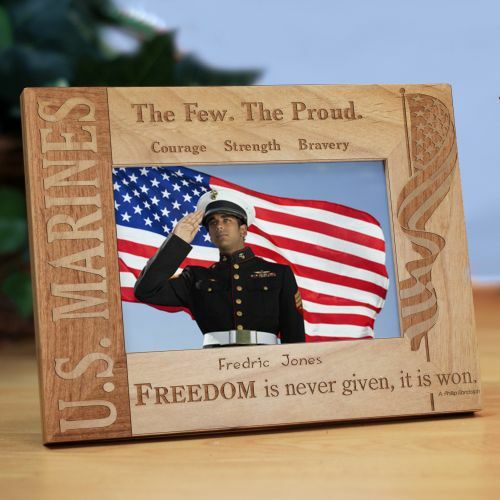 Our Personalized U.S. Marines Wood Picture Frame measures 8 3/4" x 6 3/4" and holds a 3½" x 5" or 4" x 6" photo. Easel back allows for desk display. Includes FREE Personalization! Personalize your U.S. Marines Picture Frame with any title and name. Frame available in horizontal or vertical presentation. U.S. Marines Picture Frame Quote reads: FREEDOM is never given, it is won.